download sg.zip with the link above, extract to some directory, and then run sg.exe. click on the big load button and select one of the included sample files. on the right you should now see a bunch of nodes. click on any node and press S on the keyboard to view and hear the data at that node. click on the lowest node in the vertical chain and hit S to view and hear the final sample. nodes can be moved by dragging them with the mouse. they can also be resized by dragging the resizing bar on the right of any node. to create a new node, right click and select a node type. when a node is selected, its properties are displayed in the lower left. 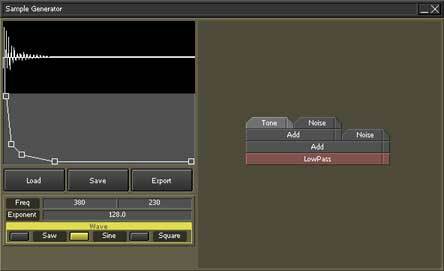 special load and save nodes can be used for complicated audio samples. use a save node to make a copy of the current sample data then use that in any number of load nodes. just give them all the same name. properties are manipulated with a variety of controls. most are displayed with spinner controls. these look like boxes with a number in the center. to change the value, click and hold on the spinner then drag the mouse up or down. when a spinner has focus you can also use the keyboard arrow keys to fine tune the value. if you encounter bugs or need some features or something email sg@blackpawn.com. because i get spammed like you wouldn't believe, please put "sg:" in the subject line. if you have very important spam that you need to get through you can also put "sg:" in the subject line. if you do that i will have no choice but to read it. also if you make a really great sample with sg, email it to me so i can learn your secrets. oh and let me know if i can use your audio sample as an example for other people and please give a handle they can admire you by.